the basic page size is 1660 x 2040, as I originally formatted it using a print comic 14x17 inch standard. I can re-size if necessary. 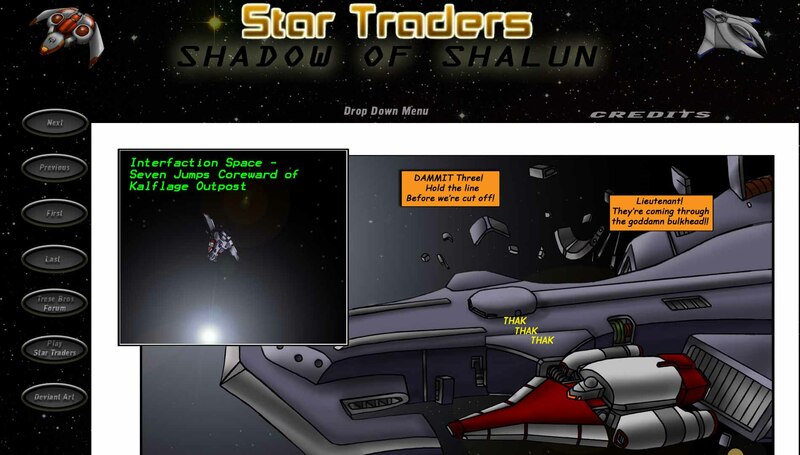 The comic is based on the Indie mobile games Star Traders and Templar Assault by the Trese Bros. It has a kind of a Battlestar Galactica, Firefly, Space Hulk feel to it if that helps at all. I ideally would like the page to link to a couple of different places, the Trese proboards forum, the product page on their website, and my deviant art page. (And perhaps an immersive section for displaying characters and technology from the comic) I do have permission for this from Trese Bros. I do have a page budget to deal with this. Anyone interested contact dayaninikhaton@gmail.com. Thanks! Last edited by Ddraigeneth on January 8th, 2014, 1:52 am, edited 1 time in total. I think I have this resolved. thanks for your interest.